In this, our twelfth Neighborhood Letter, we’ll tell you about our upcoming “Guilt-Free” cooking class that features locally grown produce, how you can “Get Lucky & Go,” and we’ll share a delicious summertime recipe. We’ll also let you know about some upcoming special happenings where you can use our O.Henry Hotel as a luxury base-camp while you enjoy decadent spa treatments, Broadway-quality theater, and some of the world’s finest young musicians. You’ll also learn a little bit about some of the most key members of our team, the General Managers. We love to brag about this friendly, competent lot because we are rightly proud of each of them. We are proud for many reasons, but mostly because each sincerely shares our commitment to friendly, competent service. Please say hello to them when you visit. They would be delighted to know you, if they don’t already. And, if they, or any of us, can be of service to you…please let us know. 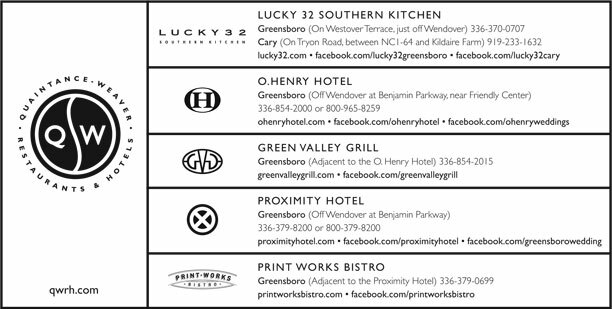 Cary Lucky 32 – Laurie Thornburg is the General Manager of our new Cary restaurant. You may recognize her, and some other folks such as Laura Pope and Holly Thomas, from our Raleigh Lucky 32. Laurie first joined us in June of 1993 as the Bar Manager in Raleigh, then became the General Manager in 1997. Laurie loves the restaurant business – she’s been in it since she was thirteen and she’s done everything from shucking oysters to earning a degree in Food and Nutrition from Meredith College. While she misses the regular guests from the Raleigh Lucky 32, Laurie says that she’s having a great time meeting people in the Cary community. She and her husband William are expecting their first child in June. Greensboro Lucky 32 – Karen Albright joined us at the Greensboro Lucky 32 in September, 2001. Karen has years of experience working with the public and she loves the restaurant business. “The fast pace and the people are wonderful. I’ve made a lot of friends at work, and it’s great getting to know our guests.” In the last few months Karen has gotten to know the restaurant inside and out – she even spent four weeks working in the kitchen. When she takes time out of her busy schedule to relax, you can find her on a boat or at the beach with her sweetheart. You may be wondering what Beth Smith, Greensboro Lucky 32’s former manager, is up to these days. You can find her at our Cary Lucky 32. Beth chose to take less responsibility so she could move to Raleigh to complete her double major in Biology and Zoology at NC State University. Raleigh Lucky 32 – Jim Aroner has been the General Manager of the Raleigh Lucky 32 since August, 2001. Prior to joining us, Jim was Director of Operations for a restaurant and catering company in San Francisco. Jim is passionate about the restaurant business and says that the same reason he got into it back in 1972 has kept him in it all these years – he loves meeting and greeting people and finding ways to make them happy. Jim and his family came to North Carolina from California looking for a beautiful place to live with friendly people. Not only did they find that, they also found a great place for Jim to pursue his other passions – renovating vintage homes and making furniture. When he’s not at Lucky 32, Jim and his wife, Alana, enjoy their hobbies and spending time with their 5-year-old daughter. Winston-Salem Lucky 32 – Jennifer Martin is the new General Manager of our Winston-Salem Lucky 32. She’s been on our team for nearly seven years and has done everything from bartending to accounting in our home office. Jennifer says she enjoys playing the role of General Manager most because it gives her the opportunity to get to know our guests on a personal level. Scott Gleason, Winston-Salem Lucky 32’s former manager, transferred to our Cary Lucky 32 so he could help with the opening and be closer to his family in Raleigh. He’s staying in touch with Jennifer so he can keep up with all his favorite guests – especially his Sunday brunch regulars, who he says he’ll come see soon. Green Valley Grill – Martin Hunt has been the General Manager of the Green Valley Grill since he and his bride Becky, who is the accountant for the O.Henry Hotel, moved to Greensboro from Augusta, Georgia in July 1999. Martin has been in the restaurant business since he was eighteen and has played the role of General Manager with two other restaurant groups in the Southeast. Martin says that he loves working with the team and becoming a part of the Greensboro community. He and Becky celebrated the birth of their daughter, Sarah Elizabeth, on November 1, 2001. Elisabeth Green, Director of Sales for our O.Henry Hotel, is the perfect person to advocate the O.Henry and the Green Valley Grill’s catering to our community. She is friendly and detail-oriented and, most importantly, she sincerely believes that the O.Henry is the best hotel of its type in her universe. She leads a team of four professionals who help our guests with everything from weddings and bar mitzvahs to conferences, symposiums and corporate meetings. She enjoys hanging out with her best buddy, Ben (a.k.a. her husband) and doing volunteer civic work. Quaintance-Weaver Management – Christina White, our Controller, is sort of the General Manager of our corporate office, which provides the restaurants and hotel with financial data, as well as marketing and administrative support. Christina and her team handle the paperwork so our leadership teams can focus more on our guests. “The two best parts of my job are the people I work with and our company’s mission. We are always focused on our guests’ experience and having that clear vision makes my job easier,” she says. Christina is crazy about basketball and plays regularly, and she and her husband enjoy getting away to the mountains of Virginia to visit her family.